Despite evidence and clinical practice guidelines supporting physical activity (PA) for people with lung cancer, this evidence has not translated into clinical practice. This review aims to identify, evaluate and synthesise studies examining the barriers and enablers for patients with lung cancer to participate in PA from the perspective of patients, carers and health care providers (HCPs). Systematic review of articles using electronic databases: MEDLINE (1950–2016), CINAHL (1982–2016), EMBASE (1980–2016), Scopus (2004–2016) and Cochrane (2016). 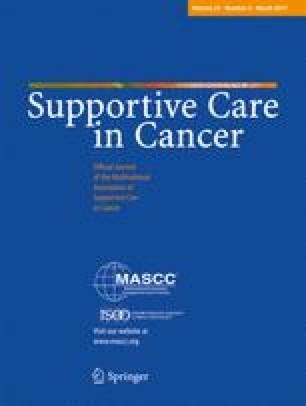 Quantitative and qualitative studies, published in English in a peer-reviewed journal, which assessed the barriers or enablers to PA for patients with lung cancer were included. Registered-PROSPERO (CRD4201603341). Twenty-six studies (n = 9 cross-sectional, n = 4 case series, n = 11 qualitative) including 1074 patients, 23 carers and 169 HCPs were included. Barriers and enablers to PA were identified (6 major themes, 18 sub-themes): Barriers included patient-level factors (physical capability, symptoms, comorbidities, previous sedentary lifestyle, psychological influences, perceived relevance), HCP factors (time/knowledge to deliver information) and environmental factors (access to services, resources, timing relative to treatment). Enablers included anticipated benefits, opportunity for behaviour change and influences from HCPs and carers. This systematic review has identified the volume of literature demonstrating that barriers and enablers to PA in lung cancer are multidimensional and span diverse factors. These include patient-level factors, such as symptoms, comorbidities, sedentary lifestyle, mood and fear, and environmental factors. These factors should be considered to identify and develop suitable interventions and clinical services in attempt to increase PA in patients with lung cancer. The online version of this article (doi: 10.1007/s00520-016-3484-8) contains supplementary material, which is available to authorized users. The work of two authors (CG, LD) was included as a primary study in this review . This work is supported by Fellowships to the following authors: Dr. Granger is partially funded by a National Health and Medical Research Council Translating Research Into Practice Fellowship co-funded by Cancer Australia. Dr. Parry is funded by a National Health and Medical Research Council Early Career Fellowship. Dr. Connolly is funded by a National Institute of Health Research Postdoctoral Fellowship.